1. Hearts Print Blouse. 2. It' by Alexa Chung Book. 3. Cream satchel. 4. Multicoloured earrings. 5. Eye Colour Palette. 6. Girls Cookbook. 7. Spice Make Up Collection. 8. Running Yellow iPhone 5 /5S Case. 9. Mary Katranzou for RodialCandle. 10. Pockets Woolen Coat. ENG: Let’s continue to choose presents! This time it’s for best friend. Do you have one? I sure you do! So it can be pocket mirror or phone case, even coat or lovely bag. Everything depends from your imagination and desire. Make your one best gal little bit happier! RU: Продолжаем выбирать подарки! На этот раз – для самой лучшей подруги. Это может быть красивое зеркальце или чехол для телефона, а возможно даже сумка или пальто. Все зависит от вашего желания и воображения! I Like all of them! Especially Blouse & Coat. Love number 1 and 10! I would be a happy lady with any of those gifts! And if one is at the moment not one´s best friend he will be for sure after getting one of these wonderful presents the best friend :) The blouse is so cute! Розовое пальто просто звезда всего сэта. Просто шикарное! I love your taste! 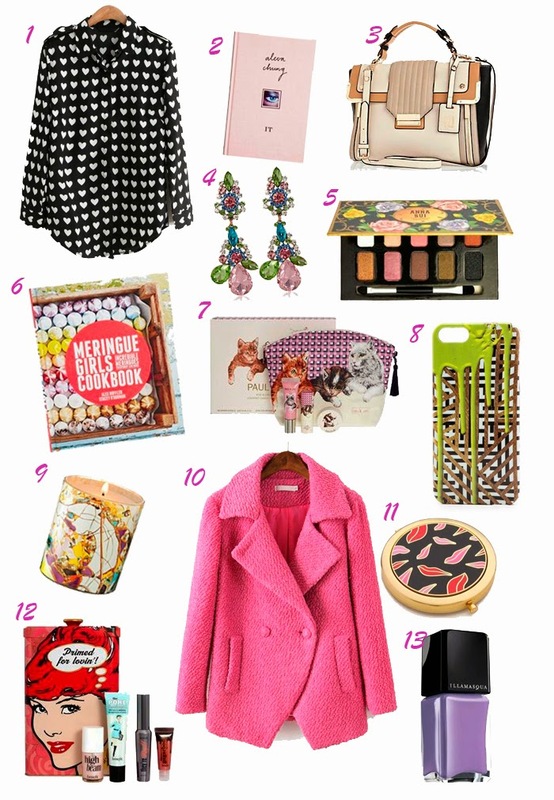 I want everything on this fabulous list, the earrings and coat are so beautiful and adore the beauty sets too. You are so kind to visit, hope your week in going wonderfully. I would like to receive the Alexa Chung "It" book. Your choices are lovely. Спасибо за чудесную подборку , такую незаменимую в предпраздничные дни . Обязательно воспользуюсь!!! Целую!! !